Nice makeover of a Victorian Theatre Bar by the Bitter and Twisted Company. Lovely decor inside and good ale - a well kept Salopian Golden Thread. 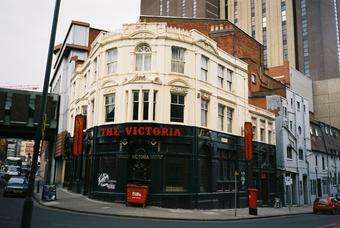 There's something about the Victoria I really like. It looks a dump from the outside. But it's far from it inside. Situated almost at the bottom of the steps of New Street station's new southern exit, it's popularity can only increase. It was an unscheduled stop here, but worthwhile as we found our favourite beer of the day - Cocoa Wonderland from Thornbridge. Other options were Purity Mad Goose, Sadlers Sorachi Solo, Blackjack Royal Flush & Left Handed Giant Brewing USPA. Much quieter than on my previous visit and an older clientele. But I'll be back. Very dark inside the main bar, only one of the bar fronts serves real ale, so you have to push your way through the throng that stay in front of the handpumps. I wish they woulld move to one of the other bars that have more room. A wee bit too cool for an oldish bloke but any port in a storm in what passed for summer in these parts. I had a pint of Cloudwater Grizette, apparently a Belgian ale style & quite tasty. 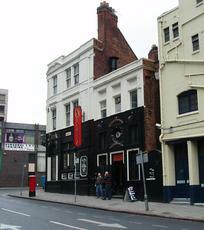 At 3.80 it was the dearest pint by miles I had in Birmingham, only approached by that other hipster haunt Sun on the Hill. Suppose you have to pay for artisanal styles but as I was the only one in on a Sunday afternoon I wonder if the range & prices are uber popular. Popped in for a quick - impossible as the service was too slow, so hotfooted it to another pub instead. Noticed a couple of real ales on tap but sadly beyond reach.